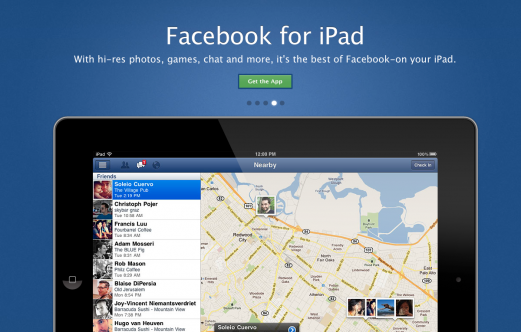 One year, six months, and seven days after the iPad first went on sale, Facebook has at last released its app for Apple's tablet. 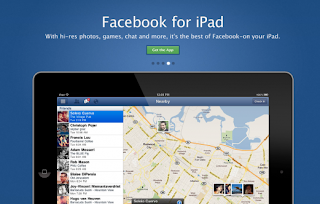 "Many of you have been asking about Facebook for iPad," the company said in an understated blog post Monday. "Today, it's finally here." The long-delayed app has the subject of much Silicon Valley chatter. Some rumors suggested that a rift between Facebook CEO Mark Zuckerberg and Apple's executive team over Apple's Ping social network was to blame for the delay. Others claimed that Facebook preferred a Web-based application that bypassed Apple's strict app store rules. Former Facebook developer Jeff Verkoeyen, the lead engineer on the the iPad app, wrote on his blog recently that he quit the company after Facebook continually delayed the release of the iPad app. It had been in the works since October 2010 and was essentially completed in May, Verkoeyen said. "For reasons I won't go into details on the app was repeatedly delayed throughout the summer," Verkoeyen wrote. "Needless to say this was a frustrating experience for me. The experience of working on this app was a large contribution to the reasons why I left Facebook, though that doesn't mean it wasn't a difficult decision." Verkoeyen, who now works for Google, later updated his blog post to strip out his criticism of Facebook and his comments about the app's delay. If Verkoeyen's timeline is correct, that means that the Facebook iPad app was stuck in limbo longer than the Apple's notoriously delayed white iPhone 4. But like the white iPhone, Facebook's iPad app has finally appeared. The application showcases many of the familiar Facebook features, integrating gestures and swipes to help users navigate the social network. "With the iPad app, you get the full Facebook experience, right at your fingertips," Leon Dubinsky, a Facebook mobile engineer, said in a blog post that he wrote "from the comfort of his couch." Games, apps, groups and lists appear in a menu on the left-hand side, giving users quick access to their most-frequently used tasks. Messages and notifications appear at the top of each screen, so Facebook users can chat with friends and view updates without jumping back and forth between screens. The app also allows lets users play full-screen games, watch and record HD videos and stream them to other devices using Apple's Airplay technology. The app had been noticeably absent from Apple's iTunes app store, considering that Facebook had been among the first to debut an iPhone application in 2007. The social network also said Monday that it made several improvements to the iPhone app and Facebook's mobile site, giving users simplified navigation, faster search and access to more games and apps.